CP-CT260 is a 2-way speaker pairing a 6" C-CAM bass driver with a 1" C-CAM pivot gold dome and innovative Tri-Grip fixing system making it easier to install. 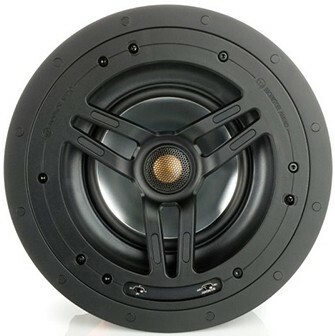 Monitor Audio CP-CT260's pivoting C-CAM tweeter is paired with a 6" C-CAM bass driver and high-frequency level adjustment by a boundary control for maximum bass tuning when located near room corners. The optional square grille can be used with this model. CP-CT260 has high overall efficiency and high-frequency level adjustment (+/-3dB), boundary compensation controls and innovative Tri-Grip fixing system making it easier to install than traditional clamping schemes but enhances three times the surface area and a greater surface seal augmenting bass response and mid-range clarity. Magnetic and easily removable steel grille with a paintable surface to blend with the living environment. Additional scrim material is supplied for hassle-free painting while sealed enclosure design, which guards each accurately-engineered driver system against the degrading ingress of dust and dirt.